Granada is the city built upon hills, and within each of them there are countless secrets to discover. Apart from the incredibly intertwined Spanish and Moorish architecture laced throughout the city, and the stunning Alhambra palace, the city has a few other special gems, especially Granada’a festivals that take place all throughout the year. Granada’s biggest and most popular festival by far is Corpus Christi, which is usually celebrated for a week in June, though the specific date depends on when Holy Week falls each year. Though Corpus Christi has religious roots, nowadays it’s more about the celebration and being with friends any family. This festival in Granada has just about everything – there are beautiful processions through the city, a fair with a beautiful set of lights and flamenco music, bull fights and so much more. Granada comes alive during this festival, and it’s a wonderful time to visit the city. On January 2 each year, Granada celebrates the Fiesta de la Toma, in which everyone celebrates the historic day in 1492 when Isabel and Ferdinand took Granada back from Muslim rule. This festival is unique to Granada, as it was the last city to be taken back from the Muslims, and the day is spent in celebration of that and the Catholic Kings who were triumphant that day. Each year, a flag commemorating the Spanish monarchs is hung at the town hall, and of course the city takes the day off of work and school. Is celebrated in May, the whole city gets a burst of color as floral decorations pop up all over the city – within plazas, on the streets and even on balconies. A beautiful cross is set up in most of the city’s squares, and in true Spanish fashion so is a bar right beside it, serving up refreshing beer, wine and delicious Spanish food. Is a prevalent festival in Granada, just as it is all throughout the South of Spain. Semana Santa in Granada is much like the Holy Week found in both Seville and Córdoba. 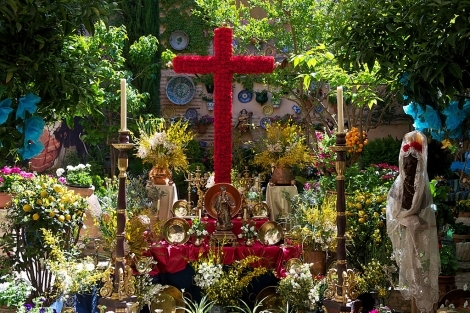 The whole week is dedicated to beautiful processions of men carrying heavy floats called “pasos,” that usually hold a very ornate sculpture of Jesus or a crying virgin. The pasos are followed by live bands playing typical music from the week, as well as more people who carry other pieces of the procession like candles and incense. It’s truly a unique take on Holy Week and absolutely a festival to see while in Granada. The somber music and slow-moving processions create an unforgettable experience, and it’s a deep look into both Southern Spanish culture and history.